Expert tips for traveling by car with your favorite canine companion. It wouldn’t be a family car trip without Fido, but if you want everyone who’s along for the ride — two-legged and four-legged — to have fun, you need to do some prep work. Acclimate your pooch to the car in the weeks leading up to your trip. Collins recommends taking your dog on short car rides around town. It will help him get used to the doggy seat belt or carrier — a must for safe travels — and it will reveal any tendencies to get overly nervous or carsick. Ask your vet about motion sickness and sedation medications. If your dog gets in your vehicle only for dreaded trips to the vet, take him somewhere fun, like a park where he can run, Collins says. That way, he’ll begin to associate getting in the car with receiving a reward. Many dogs, Collins says, only feel comfortable eliminating at home, so it’s also essential to train your dog to go to the bathroom in unfamiliar places. “The poor dog could be near exploding because it doesn’t feel right to go elsewhere,” she says. Before you leave on vacation, spend a few weeks developing a potty cue. Whenever your dog is on the verge of eliminating, say a phrase like, “Time to go!” Then, when he’s done, praise him and give him a treat. By the time you hit the road, saying your cue should get him to do his business on demand. Most dogs are like their humans — they can’t go too long without a potty break. Plan to stop every few hours. Look for places where your dog can get some relief but also enjoy some exercise, which will help your pet relax in the car. So will chew toys. Stick to your dog’s feeding schedule. If he eats at 8 a.m., feed him then. And keep plenty of bottled water handy. 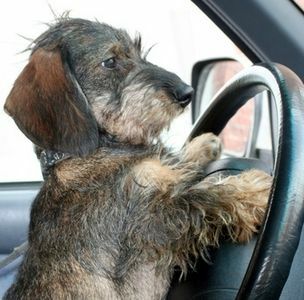 Another rule of the road: Dogs should not be left alone in the car. Cold and hot weather can be deadly to animals. If you absolutely have to leave your dog for a short while, park somewhere where he can see you, and crack a window so he can get some fresh air. Finally, make sure your dog’s head stays in the car window. You want to make sure everyone arrives in one piece. Posted on August 7, 2012, in Life In The Fab Lane and tagged animals, dogs, mile marker, travel, vacation. Bookmark the permalink. 2 Comments. Anyone who has the pleaure of owning a furry companion should read this informative post…we’ll pass it along 🙂 http://www.tresorsdeluxe.com! Thank you for the response and sharing the post with others. We have a 2 yr old Cocker Spaniel and he is one of the family, Just like our daughter. So we have to take in account his well being every time we travel. Whether he stays in a boarding facility or if he goes along for the ride.